Sam Maloof (1916-2009), the self-taught California woodworker and furniture-maker, designed and made more than 5,000 pieces in his studio in Alta Loma. Utilising both traditional and modern styles, Maloof created furniture that blended beauty and utility. His work is part of the permanent collections of the Metropolitan Museum of Art, the Museum of Fine Arts in Boston and the Philadelphia Museum of Art. His signature rocking chair, with its sensuous, sculptural quality, is also part of the White House Collection of American Crafts after a chair was acquired by Ronald Reagan. The work of Milanese artist Piero Fornasetti (1913-1988) is difficult to place into one artistic category. At once a painter, sculptor, designer, inventor and interior decorator, Fornasetti emblazoned scenes from his imagination on everything from neckties, plates and chairs to bathtubs, bicycles, chandeliers and bathroom tiles. His creations embodied a post-war mentality of ‘anything goes’. Among his favourite motifs are the façades of neoclassical buildings, various celestial and astrological symbols, and the often disguised visage of Italian opera singer Liza Cavalieri. Original pieces date back to the early 1950s, but some designs have been reissued in various editions by Fornasetti’s son, Barnaba Fornasetti. 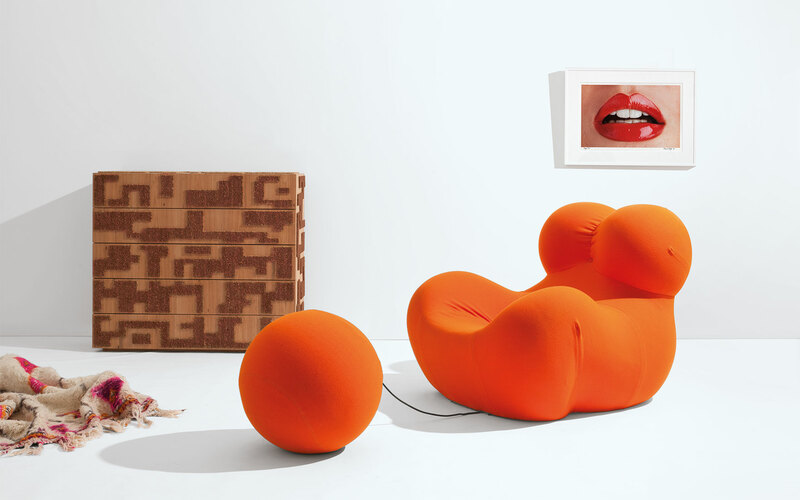 Designers Fernando and Humberto Campana grew up in a suburb of São Paulo bordering the Brazilian jungle in the 1960s. The brothers’ relationship with nature and with the teeming metropolis influenced the way they would later approach their vibrant designs. Their work (which includes furniture, apparel and industrial design) addresses such tensions as technology vs. craft, natural vs. synthetic, modern vs. ancient. They often use recycled or discarded materials or draw inspiration from humble sources such as storm drains, rag dolls or invasive vines. Italian architect Gaetano Pesce (b. 1939) made his first foray into furniture design with the incredibly successful ‘Up’ series in 1969. A supporter of the Radical Design movement of the late 1960s, Pesce sought to challenge the concept of ‘Good Design’ which he believed had been diluted for mass consumption. Each chair in the ‘Up’ series is made of upholstered polyurethane foam which was vacuum-pressed into an envelope for packaging. Once opened, the chair dramatically swelled to life, exhibiting voluptuous anthropomorphic curves. Full of experimentation and irony, Pesce’s designs express his belief that modernism is ‘less a style’ than a ‘creative response’ to the present. He continues to work in various disciplines, constantly exploring new materials and unconventional shapes, and has works in the permanent collections of the Metropolitan Museum of Art, the Pompidou Centre and the Vitra Design Museum. As a sculptor, furniture and jewellery designer, graphic artist and metalsmith, Harry Bertoia (1915-1978) was a gifted cross-disciplinary artist. Perhaps most widely known for his wire furniture collection for Knoll introduced in 1952 which included his famous Diamond chair, Bertoia also produced more than 50 commissioned public sculptures. At once strong yet delicate, his works explore the tension between their intricate, precise forms and the powerful, natural metal materials used in their construction.